'Tis the season for do-gooding. Be inspired with charitable ideas to improve your school and your community. With the holidays swiftly approaching, it's the time of year when people start thinking of ways to give back to the community. 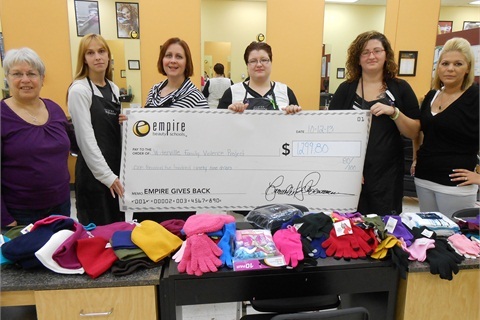 At Empire Beauty Schools, the season for giving is year-round. The 110-school chain recently raised more than $45,000 for more than 100 local women’s shelters across the country with its annual National Day of Beauty event. Empire Beauty School also supports the Cut It Out program, a curriculum designed to teach beauty professionals how to recognize the signs of domestic abuse. 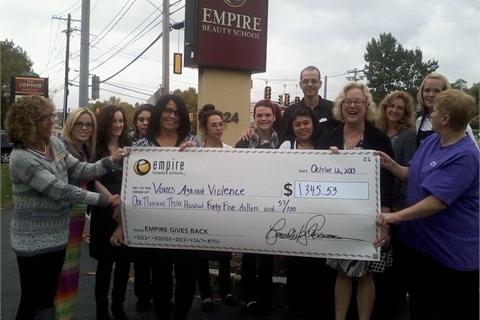 Empire Beauty School trains students on how to comfortably point victims to the National Domestic Violence Hotline. Plus throughout the year all Empire schools support their local shelters with additional fundraisers and free salon services for shelter residents and their children. Empire Education Group also offers educational endowments to any shelter residents interested in attending beauty school. Contact a nearby Dress for Success affiliate via dressforsuccess.org and offer to do the hair, make-up, and nails for candidates who are preparing for job interviews. Support another school (such as a local middle or high school) by starting a "Tips 2 Teachers" program in which the students donate half their tips from the school-affiliated salon to a teacher to help pay for classroom-related supplies. Host a one-day event (it can even be an all-nighter, especially if you get help from neighboring salons) in which all the proceeds from manicures, pedicures, haircuts, etc., go to charity. Advertise the event in local media to draw a large crowd. How does your school give back to the community? Let us know in the comments!